AIRCEL the fast growing Pan India telecom operator in the country, today announced the launch of the Free Unlimited Email and Internet Data Bundle offer to its postpaid customer who buy new BlackBery Torch 9800 handsets. AIRCEL is the first one to make a move after the launch of Blackberry Torch-9800 in India with path-breaking Unlimited Free Data plans for one Year from the date of activation.The handset will be available in Aircel Stores at Rs 32000. The new Unlimited BB Torch service plan will enable its subscribers to enjoy Unlimited e-mail, Instant messaging (IM), social networking and Internet browsing. It will be available only for its Postpaid GSM subscribers over BB Torch 9800. Presently Aircel offers Blackberry services in Delhi, Mumbai, Chennai, Rest of Tamil Nadu (Coimbatore), Hyderabad, Bangaluru, Kolkata & Orissa telecom circles. 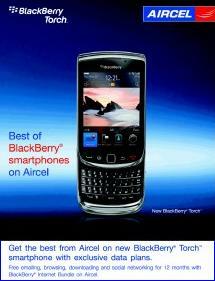 For more details on Aircel-BB Torch 9800 offer call Aircel Customer care or Visit Aircel Stores. No Way. I’ve Viewed Uninor’s Website in That Uninor is Having 6 towers installed in Kolar City in Coverage Map. And Live Example with me i’m Using DOCOMO, AIRCEL,BSNL and Bought Uninor yesterday. DOCOMO, AIRCEL and BSNL are having Full Coverage in Most of The Areas Whereas Uninor is Operating Under 1 Signal Bar and It’s Towers located in the areas Where Other Operators coverage is Very Poor. This Uninor is Irritating me With it’s Poor Network. And Uninor Will Not Have Very good Network in Most of the Areas Where my Relatives and Friends Live.